Every year we watch as the green returns to the grasses and the trees bud, checking the temperatures, measuring the rains… I look out the windows and plan the planting, imagining a summer garden lush with flowers and vegetables. The containers are pulled out of the shed, emptied and cleaned, ready to be filled. The porches that have served as storage are now serving as cozy sitting areas where we rest after our labors. This Spring has been the best we’ve had in years, meaning there have been no hard frosts (or snow!) to kill the tender buds of the dogwoods, magnolia, and redbuds and they are now flourishing. The daffodils came out in exuberant droves, the forsythia and quince bloomed in an abundant array of beauty. The pollens are also prolific and my sinuses are blooming with snot… Mornings sound like a TB ward around here as I clear my throat from the night’s drainage, but I can live with it just to be out gardening in the Spring. The average last day of frost in these parts is April 15, but I’m still leery of planting vegetables. I remember too many Derby Days (first Saturday in May) wearing a coat and winter hat and have learned to be patient. 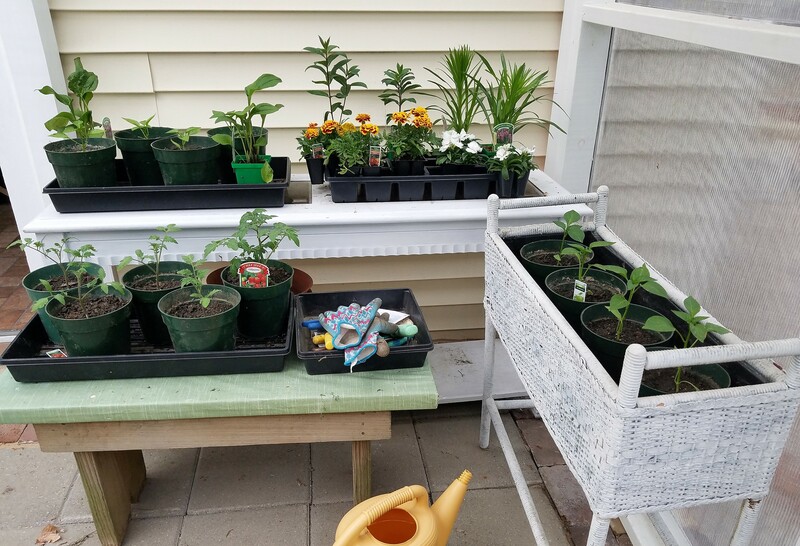 Just to tide me over, I bought a small 4-pack of Roma tomatoes, Big Bertha and California Wonder peppers, an a sweet cherry 100 and put them over in larger pots. They should be the right size to plant in about a month when I can plop them in the (warm) ground. Cilantro and arugula have been put into buckets. Peas have been planted behind the young asparagus. There is plenty of clean-up to be done. I have moved everything out of the East garden–mostly daisies, a few coreopsis–and it is ready for a new vision. I have daisies coming out the wazoo, but they don’t fit in with the plan for my Bird Garden, so they’ve been relegated to the front porch area and over in the North garden. There are a lot of leftovers…always a challenge. 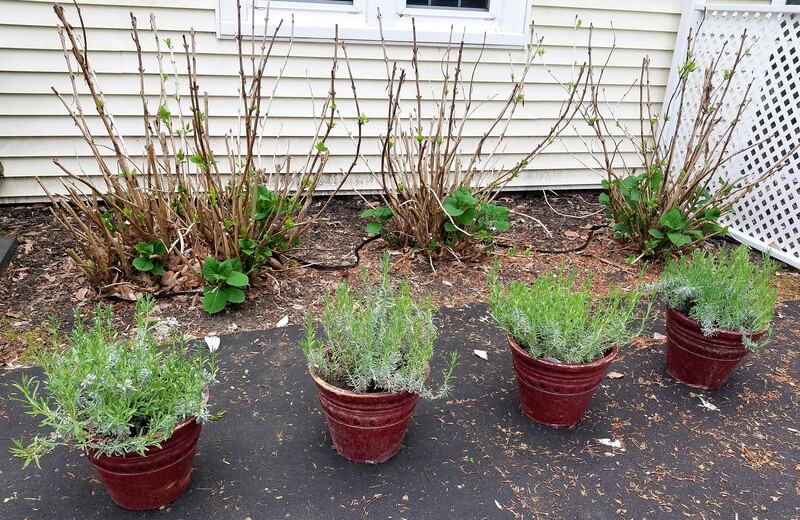 For now I’m going to plant my four pots of lavender in front of the hydrangea. Clearly, nature calls to something very deep within us. When I am in the garden, whether or not the thing grows is not the point; whether the garden is symmetrical is irrelevant. The weeding and the watering or just the admiration of the season is All. Gardening has changed my brain, I’m certain, and has built pathways directly to my Soul where we are All One. You and me and all Living things and all meditations and all prayers and all art and all songs are the Same working together as One in the Moment that is the Only Moment: Now. I’m so happy to be back at the blog, as well. 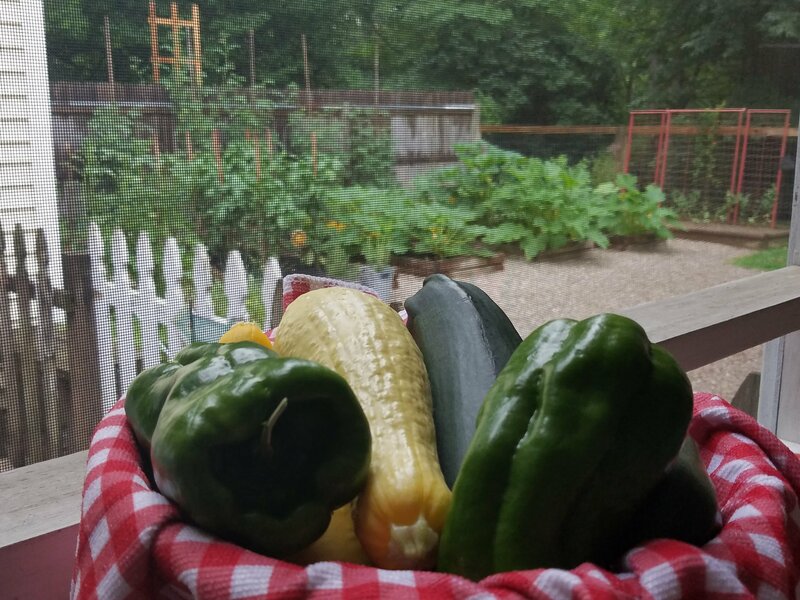 I hope you’ll enjoy spending some time in the Sonnystone Gardens with me this Growing Season. I don’t have much confidence in my ability to actually grow things in my conservatory, even though I’m pretty good with houseplants. As a result, folks often remark that I have a green thumb and to that I say Ha! I did once get some fungus growing under a fake nail, but that is as close as I’ve been to even understanding the term. 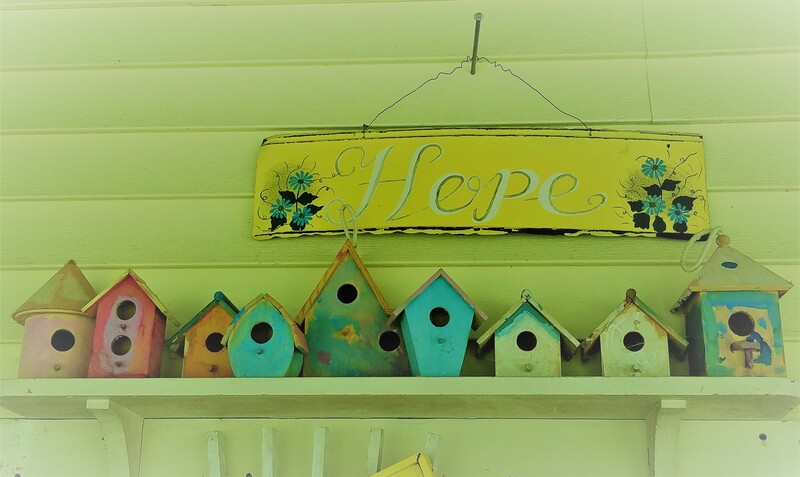 In the same way, I”m hoping to fill the conservatory with plants that Want to Live so they can survive my inexperience. I’ve got herbs! 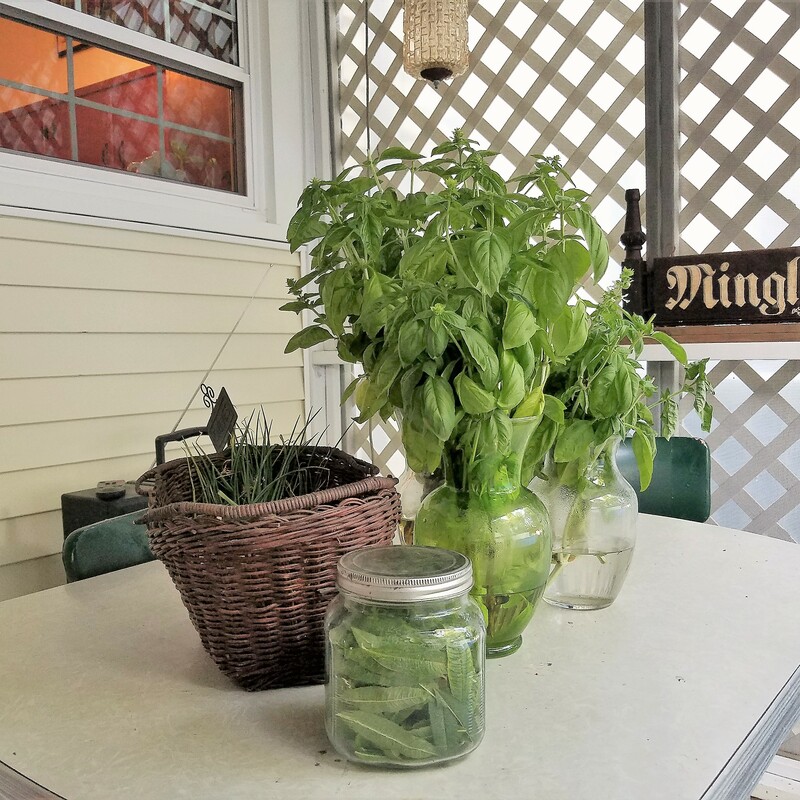 mints, rosemary, thyme, and oregano. I’ve got flowers! 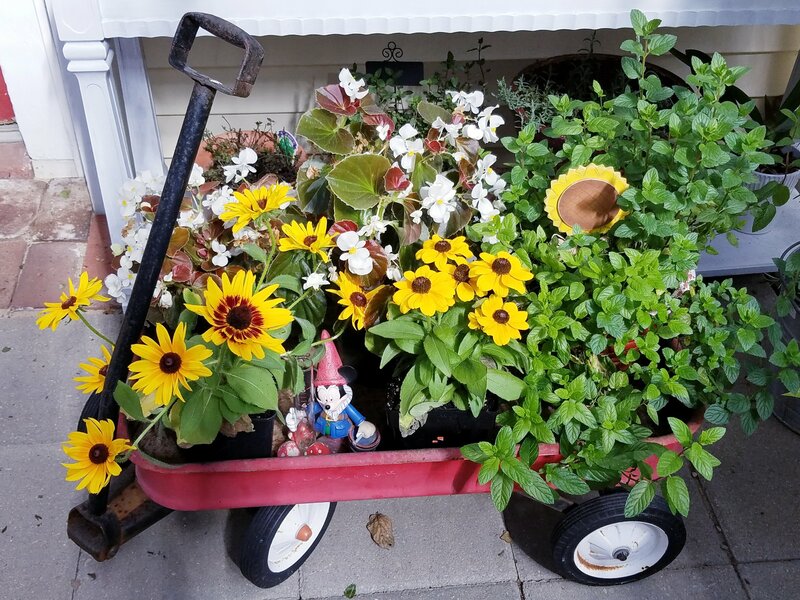 begonias, lavender, and rudbeckia. For once I’m looking forward to winter and having my own little piece of sunshine right outside the kitchen door! The month of July is always full of grandies enjoying Camp Sonnystone. 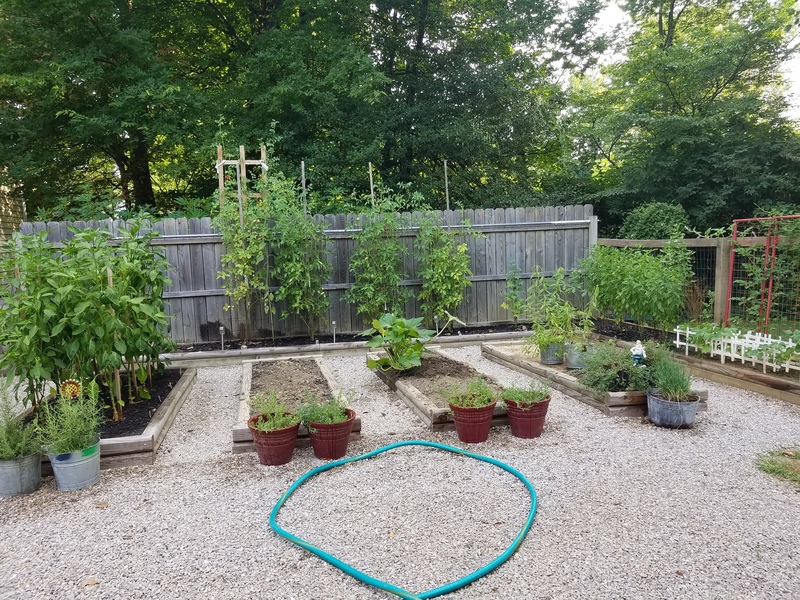 The garden takes a back seat, but we did manage to pote our buckets around and keep everything as watered as we could…well, almost everything. Despite our best efforts, the lack of rain combined with the heat took its toll. After the Jose’ fam left, we surveyed the damage and brought in whatever veggies we could, which was plenty. Most of the yellow squash had bit the dust (literally) earlier, but there were 3 zucchini producing. The tomatoes were covered with ripening fruit and the bell peppers are (still) carrying on. I ended up freezing a dozen quart bags of zucch and squash, though, so I’m happy. Now there’s one more zucchini on the last plant. I had to take down a tomato that suddenly went yellow on me, and the better boys have slowed down, but I’m hoping they’ll get started again. 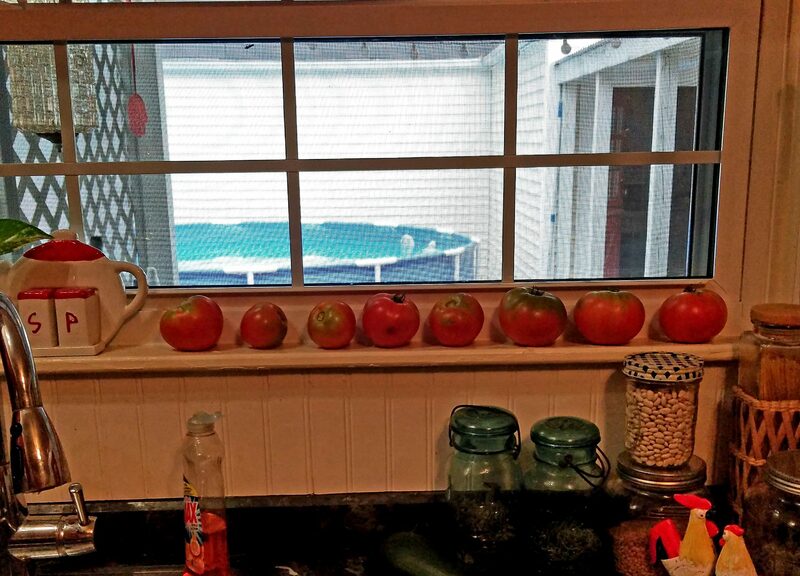 I still have dozens of tomatoes, even after making a huge greek tomato salad and slicing every chance I get. I’ve harvested 4 pots of basil and made an ice cube tray of pesto. There’s a pound or so of onions, and some chive put up. Casey’s barrel of potatoes only produced a handful, but the experiment gave us great ideas of next year. Oh, and that’s a jar of lemon verbena leaves, ready to be transformed into tea, or infused into some nice vodka. I’m really grateful, as I know many gardeners have had worse seasons and I do have a lot to show for my work. It’s just that vegetables are a bit of a gamble. Yet each year I learn something new. The flowers, though…. daisies, rudbeckia, roses (! 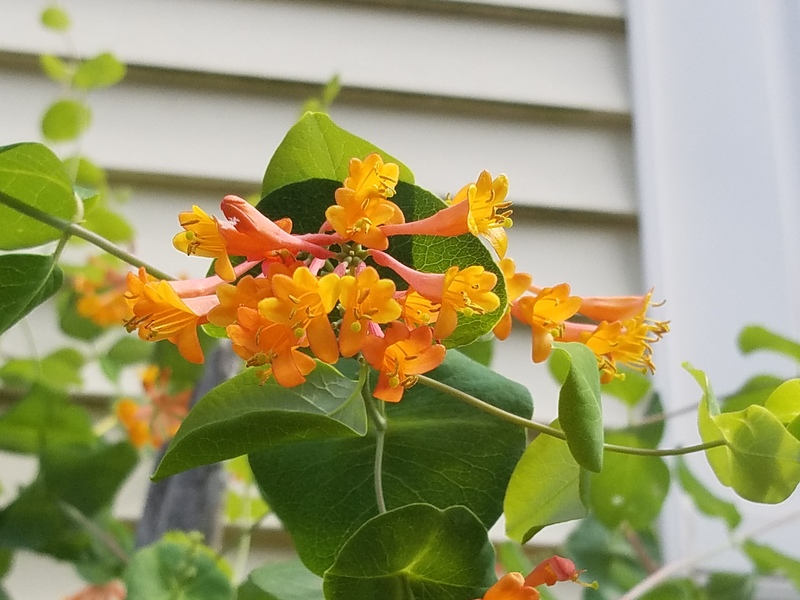 ), pineapple sage, butterfly bushes… they are blooming, attracting the birds and bugs and making me smile. I pulled up the first crop of green beans — about 3 lbs — and got them cleaned and ready to be snapped by Sonnystone Campers next week. Grandpa should have plenty of new potatoes, too. We’re over-run with Squash And Zucchini!!! It is a regular on the menu now, and I’ve frozen a couple of lbs! The Garden Fairies Love Me Again…! Still waiting for the tomatoes to ripen up, but that should be just in time for my visitors. We’re leaving the garden under Jr’s care while we drive down to Disney World to pick up the Joses and bring them back for Camp Sonnystone. They will be here until the 20th or so, and I know you’ll want to check out the Fun we’ll be having over at The News. I hope that your Midsummer is filled with flowers and harvests, Love and Peace! Thank-you, Alberto, for dropping a whole lotta rain. 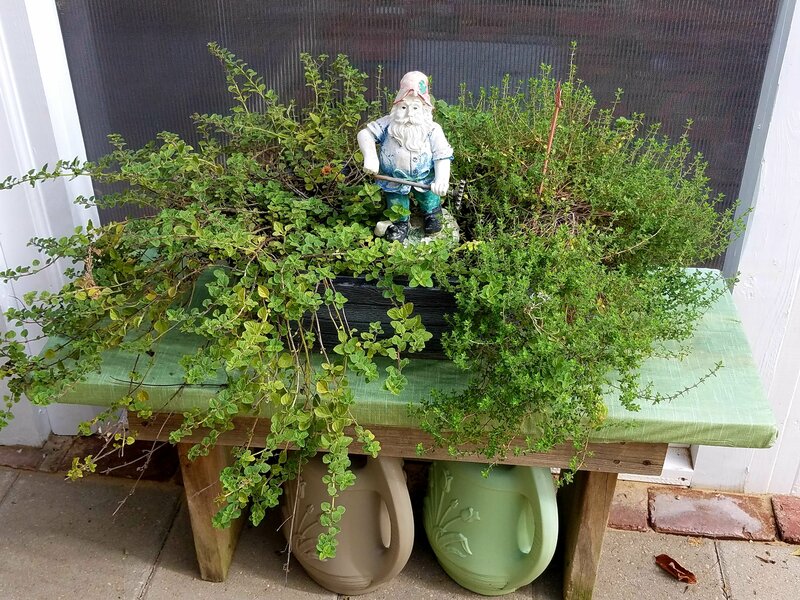 From 5/29 to 6/3 the plants jumped from…well, look! The edible garden is earning its keep, scoring a First with a lovely Better Belle followed closely by 3! Big Berthas. A dozen tomatoes are on the Better Boys and Celebrity. The cherry tomatoes are blooming all over the place. I’m especially proud of the zucchini and yellow squash. I’ve had so many Fails with them in the recent past. When we lived over on Harmon Ct. they grew like crazy, and I’ve stubbornly persisted in trying to replicate those years. It looks like this might be My Year with the Squash. I don’t want to jinx myself, though, and rile up the squash bugs that are just looking around for a cocky gardener to bring down. It really was a Whole Lotta Rain, possibly too much for some of my containers, so I’ve moved stuff around in my usual OCD manner. I’m still not done….Will I ever be? Do I want to be? So, we just skipped Spring this year, it seems. Since April 29, when our lows were a chilly 40’s and highs mid-50’s, we have had 2 weeks of blazing highs in the upper 80’s to 90’s, even set some records. We also got a hail storm, the likes of which I have never witnessed. 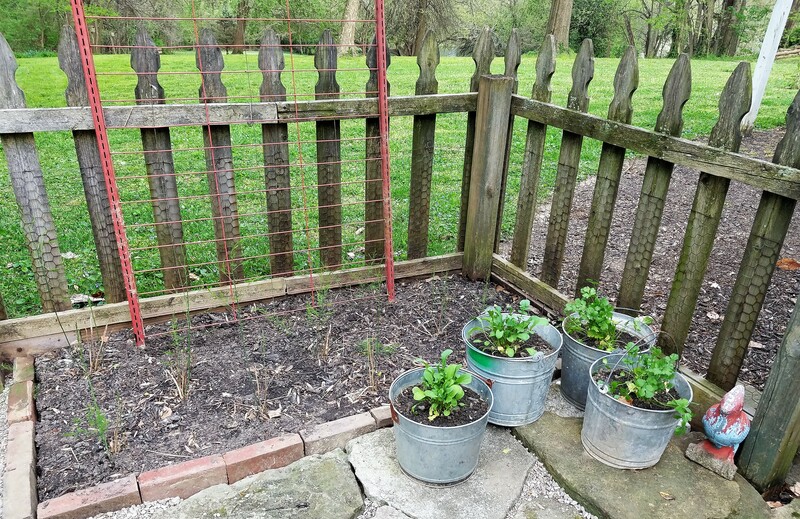 It was high anxiety watching as my newly-planted veggies were pelted, but they all made it through with minimal trauma. Now we’re in a holding pattern of clouds and rain, which is just fine. My roses were devastated by rose slugs. Can you believe it? 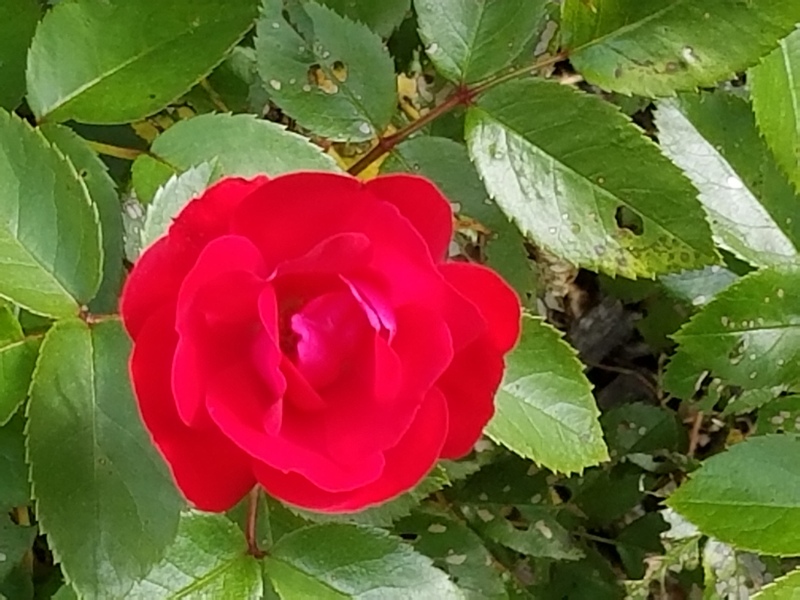 They have bloomed beautifully, but within about 3 days went from having a few holes in the leaves, to being literally foliage-free….not a good look. We have sprayed, twice, so we are hopeful that they will recover, but… I sincerely regret buying all these knock-out roses. I guess these blooms almost…kinda…sorta.. make up for the trouble. 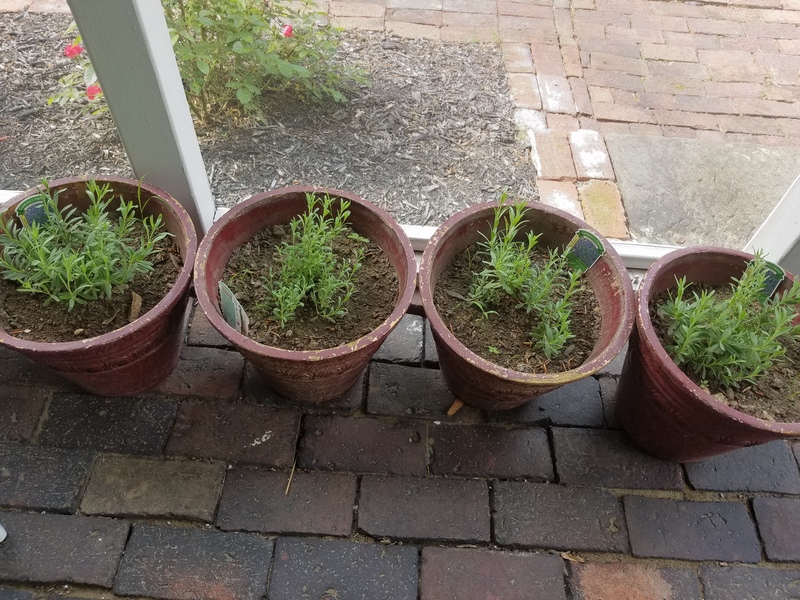 I planted lavender in containers this year, throwing in the towel at growing them in the ground. My original plan was to keep them out in the edible garden, but I’m babying them on sunniest spot on the front porch for now. Since it was summer-like, we got the pool up and the water was quickly comfortable, especially after working up a sweat schlepping around plants. We expanded the pool area and changed some stuff around. I’ll catch you up with that and the front porch (we have had some good rummage sale buys this year) over at Sonnystone Acres .